Immunogen: Synthetic peptide derived from the sequence of human Nrf2 (residues 40-60) with a cysteine residue added and coupled to KLH. Scientific Background: Nuclear factor erythroid 2-related factor 2 (Nrf2) is a transcription factor, which regulates the expression of many detoxification and antioxidant enzymes. Nrf2 can potentially play a significant role in adaptive responses to oxidative stress. Nrf2 belongs to the Cap N Collar subfamily of basic leucine zipper (CNC-bZIP) transcription factors. The NF-E2 related family comprises of Nrf1 (TCFII), Nrf2, and Nrf3 and these proteins heterodimerize with Maf proteins to bind to Maf recognition element (MARE). Under normal conditions, Nrf2 is inactive and localized in the cytoplasm through its association with Keap1. When cells are exposed to electrophiles or oxidative stress generating agents cytoplasm localization of Nrf2 is inactivated and Nrf2 translocates into the nucleus and binds to specific DNA sequence elements known as NF-E2 binding site, Maf recognition element (MARE), stress response element or anti-oxidant response element (ARE). Studies have investigated the role of Nrf2 in urinary bladder carcinogenesis, pulmonary fibrosis, and smoke-induced emphysema. A study reported Nrf2-mediated ARE transcription to be a likely target of preventative therapy in neurodegenerative disorders such as Huntington's disease. 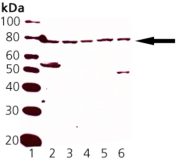 Western blot analysis of Nrf2: Lane 1: MW Marker, Lane 2: Rat Liver Microsomes, Lane 3: Mouse Liver Microsomes, Lane 4: Human Liver Microsomes, Lane 5: Canine Liver Microsomes, Lane 6: HeLa Cell Lysate.